for patients who have concerns about their teeth. Implant treatment is a type of treatment that requires an advanced level of skill and knowledge on the part of the dentist as well as specialized facilities on the part of the clinic. Unfortunately, it is difficult for the average patient to ascertain detailed information about dentist skill and knowledge or clinic facilities in advance. What’s more, even in Japan, a country known for its well-developed medical technologies, there are frequent reports of malpractice by inexperienced dentists. Anshin Implant has moved to address this situation by working on behalf of patients who are concerned about implant treatment to investigate the skills and track record of individual dentists and the facilities operated by individual clinics, establish relationships with only those that meet its high standards, and introduce them to prospective patients. We can also introduce clinics that offer service in English (or Chinese) to patients who have concerns about their Japanese proficiency. Please submit an inquiry by email to find out more. We will introduce a clinic specializing in implants that is best for you from our carefully selected network of nationwide partner clinics. In implant treatment, a state-of-the-art dental treatment that involves a surgical procedure, the treatment skills of the doctor are of paramount importance. At Anshin Implant’s partner clinics, highly experienced doctors with an average of 17 years of clinical experience who have performed a collective total of 124,000 implants will take responsibility for your treatment. Anshin Implant’s partner clinics offer free initial examinations and consultations. A doctor will be assigned to you to conduct an oral examination, examine X-rays and other imagery, and discuss a general treatment plan, timeframe, estimated cost, and payment methods with you. Your doctor will be happy to address any questions or concerns you have concerning the treatment process. This offer is an excellent opportunity to learn more about your own oral health, and we invite you to take advantage of its benefits with peace of mind since you are under no obligation to begin treatment. Anshin Implant’s partner clinics operate state-of-the-art facilities, including dental CT scan systems, sterile operating rooms, and analytical software. We evaluate these clinics in terms of both equipment and staff experience based on proprietary partnership standards so that patients can seek implant treatment with confidence and peace of mind. Anshin Implant’s partner clinics take a package pricing approach to implant treatment fees. Since estimates of treatment costs include all associated costs of treatment, you can rest assured that you will not incur additional costs as your treatment progresses. You can opt to spread out treatment costs across up to 24 interest-free payments, without any down payment. Because implants are not covered under Japan’s national insurance program and tend to be expensive, we have developed this interest-free payment option to make treatment an affordable option for more patients. *Payment plans are available to well-qualified applicants. 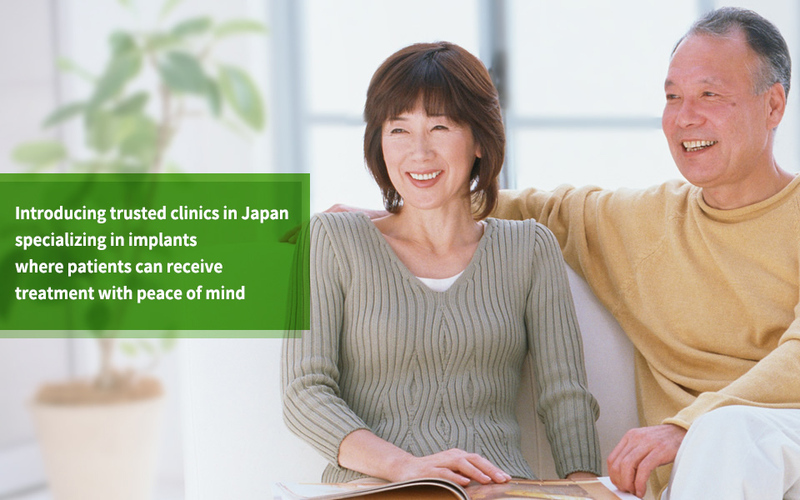 Anshin Implant’s partner clinics guarantee their work for up to 10 years. This guarantee allows patients to receive additional treatment at no additional cost in the event they experience a problem with their implants following the completion of their treatment. Please note that the guarantee is subject to certain conditions, for example the requirement that maintenance be performed at the clinic as per the instructions of your assigned doctor. a free initial examination and consultation at a trusted implant clinic. *You will be contacted by email or telephone by Anshin Implant or one of its partner clinics. Village, town, ward, or city Street address, apartment building, etc. © Nihon Implant CO.,LTD.All Rights Reserved.